Aging is one thing that is inevitable. Regardless of how much people dread the fact that they age year after year, they simply cannot do anything about it. For some people, the consequences of aging are worse than what is experienced by others. They are deprived of a decent place to live. They do not have family members or friends to take care of them as they are busy with their own lives. They are not given the medical assistance that they deserve. Generally speaking, their quality of life dwindles, making them experience a burden that is too hard to carry, especially given the fact that they are already old. Would you let these things happen to your parents or to anyone elderly close to your heart? Old age homes present the perfect solution to this problem. In India, there are more than 95 million people today who are above 60 years old. In 2025, statistical trends show that it is anticipated that almost 80 million people will be added to the country’s aging population. With the economic troubles, changing values, especially within the family, abuse, and neglect, among others, it is hard to think how the elderly can survive in today’s world. Without a doubt, old age homes are their savior! Sipani Seva Sadan is a home for the underprivileged, old aged and physically/mentally challenged people. Our purpose is to ensure the welfare and provide a helping hand to those in utmost need for free. From the inception of our Sipani Seva Sadan in 2012, driven by RK Sipani’s long term vision for helping the needy in the society, we have completed 2 years of successfully delivering the care and warmth every human being deserves. Our facility provides each and every person with medicare and the basic necessities of life. Over the past years our consistent efforts have allowed us to bring a positive change in the lives of the less fortunate. Seeing the scale of the needy in society, R. K. Sipani foundation decided to expand its Seva Sadan to accommodate a larger segment of the under privileged population. 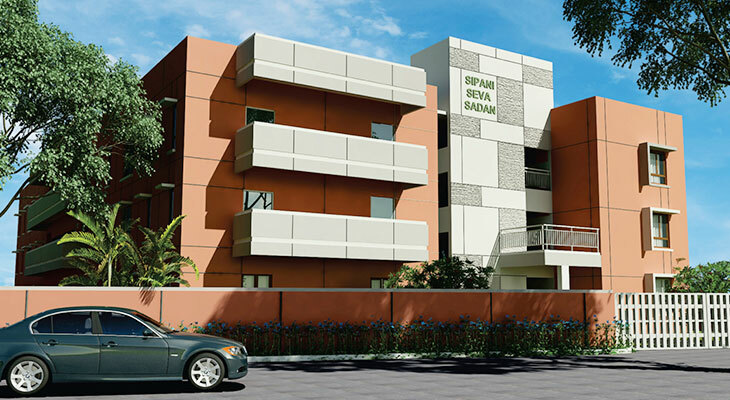 Sipani Seva Sadan now takes care of 400 people, with specialized floors dedicated to the mentally challenged (160 people), old aged (240 people). First Floor provides services to total of 120 people & is dedicated for the care of Old Age & Invalid people, who require medical care assistance. Second Floor is dedicated to the service and care of AIDS patients. This floor will serve to 120 people. All the floors are equipped with medical care facilities with Kitchen and dining hall in each floor. Jain Community has special and exclusive arrangement in each floor. Overall, the facility is a home for male and female residents, with separate accommodation for both.